I had my first bircher muesli in Switzerland. 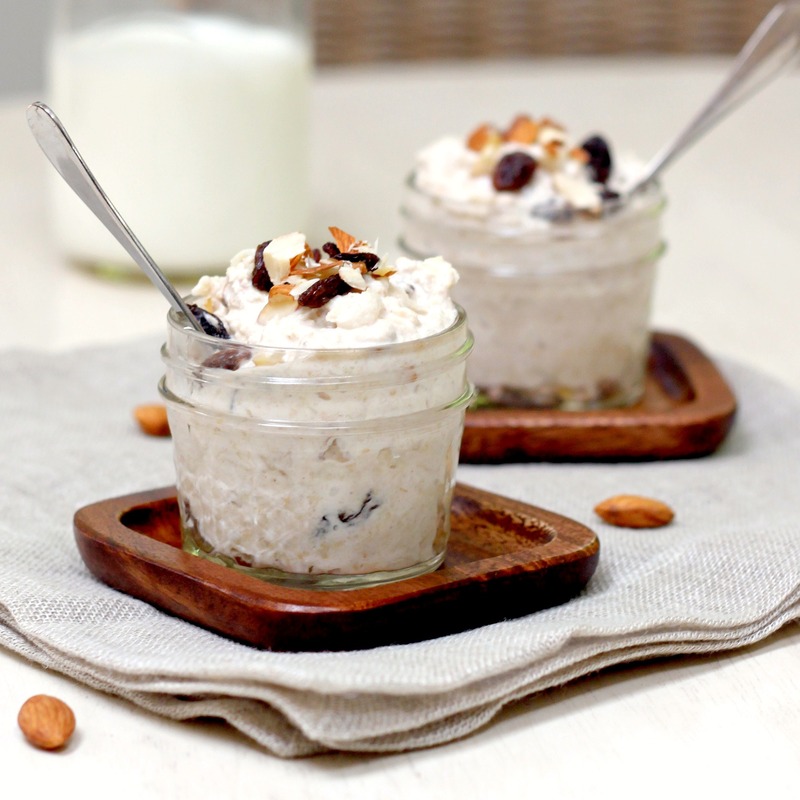 Bircher Muesli is a hearty alpine favorite and a breakfast staple. No wonder: it’s a healthy, satisfying and refreshing start to any day. The technique to bircher muesli is an overnight soaking of oats, steeped in milk or yogurt. Just before serving additional ingredients such as grated apple, dried fruit and nuts are folded in. Feel free to experiment with extra ingredients and toppings such as chia seeds, pepitas, dried cranberries, and fresh berries. If you are feeling luxurious, a dollop or two of whipped cream may also be gently folded in at the end (I call this the I-am-on-holiday ingredient). Mix the oats, apple juice, yogurt and cinnamon in a bowl. Cover and refrigerate at least 1 hour or overnight. Before serving, stir in the grated apple, half of the raisins and almonds. If too thick, thin with additional yogurt or milk to desired consistency. (If you are on holiday, then add the whipped cream). Serve garnished with remaining nuts, raisins and the coconut. Drizzle with a little honey if desired. This looks delicious and another yummy breakfast that can be started the night before. I’ve been eating this for years. In Switzerland and Germany they have a special Birchli Müsli mix you can buy. It has a varity of oat and wheat flakes in it and some have dried fruit. I love bircher muesli! Yours looks delicious. I haven’t had this one, but the ingredients are easy enough to find. I love seeing new dishes that use things I have! I’m a huge fan of bircher muesli and I love that you can make it the night before. Great recipe! I love your philosophy, being on holiday can always be a staycation! The idea of preparing breakfast the day before is very appealing, especially when the recipe is healthy and flavorful! i love a good bircher muesli in the morning… i definitely know what i will be having for breakfast tonight, thanks for sharing! I’ve only had “breakfast bar” versions of this at hotels in Europe and have never really loved it. Your version sounds so good though, I may need to make a batch from scratch to try. THANK YOU for reminding me how much I love bircher muesli!